I am a member of the Farmhouse Brewers Club based out of the Central Street Farmhouse in Bangor. We meet monthly, and usually explore a certain style. It is a pretty laid back affair, always fun, but the meeting scheduled for tonight has been thwarted by a lovely Nor’easter. So far I have almost 8 inches of new snow down, and it keeps falling, and yes, that picture above with the snow flying is from today. Anyway, since the meeting was canceled, but I happened to have some beers in the cooler, I decided to have my own tasting. First, let me explain what a SMaSH is. It stands for Single Malt and Single Hop. 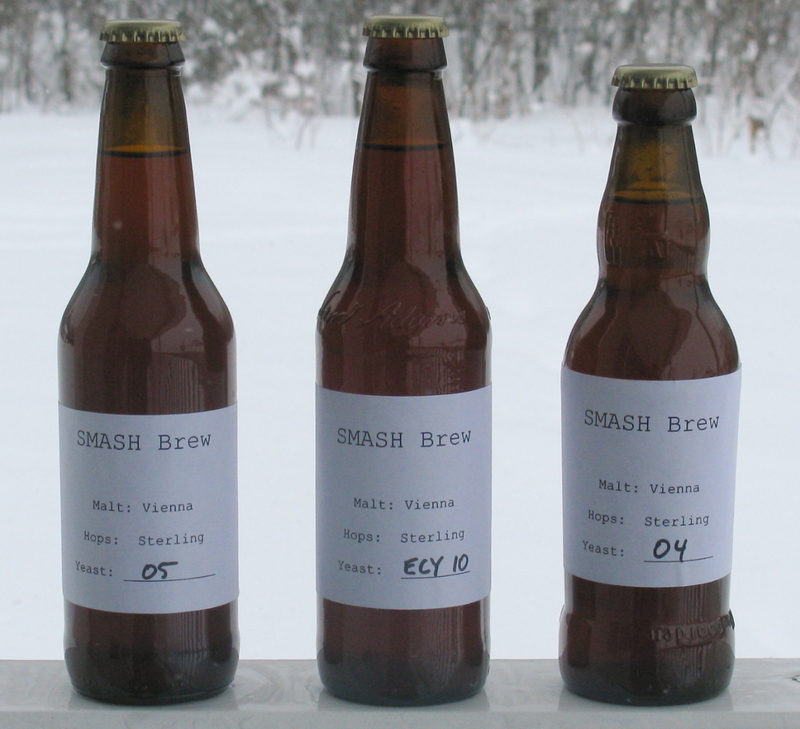 These are very simple beers that are brewed primarily to explore a specific ingredient. For example, lets say you come across a new type of hop you have not used before, and want to get an idea of what it does. If you use it as the only hop in a beer, for bittering, flavor, and aroma, then you get a feel for what it can do. However, you could use any type of yeast that you wanted. So, I decided to try sterling hops, which I had never used before. They are supposed to be a US hop with “Noble” hop flavors. “Noble” hops are the more delicate, spicy and floral hops of central Europe, specifically Czech Saaz, and German Hallertau, Hersbrucker, Spalt, and Tettnang. These hops generally are low in bitterness, and very expensive to grow. However, they are the traditional hops of German brewing, and thus known around the world. American hops are very different, often being much more citrus and piney in flavor. Cascade is the classic American hop, and is the keynote in hop flavor profile of many an American pale ale, most famously Sierra Nevada pale. However, as nice as Cascade is, it just is not right in German style lagers, if you want to be traditional. Thus, American hop farmers are trying to grow new varieties of hops with the same flavor profiles as the Noble hops, but with better yields and more disease resistance. Sterling is one of these, so I thought I would give it a try. For the malt, I wanted something with a little more backbone then a basic pale malt, so I decided to go with Vienna malt. Kilned at a higher temperature then most base malts, this leads to more darkening of the grain, and a maltier/toastier profile. Total IBU’s was 38.5, which I was hoping would showcase the hop. It was a simple infusion mash at 154F for 60 minutes. The OG was 1.052. The wort was then split to 3 buckets, and pitched with yeast after aeration for 30 seconds with oxygen. Fermented for 2 weeks at ambient of 68F, then bottled, and conditioned for 4 weeks. Here is what it looks like. Quite a bit darker then I expected. Safale 05 FG: 1.016 ABV: 4.6% — The beer was clear, it has a light, fruity nose, kind of peachy. The hops is very subdued, some floral hints, a bit of the Saaz aroma, but very much in the background. 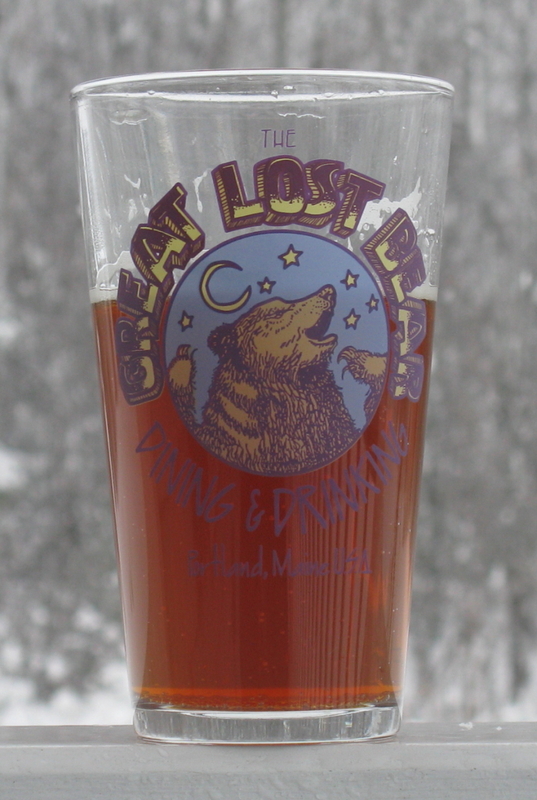 The taste is fairly malty, again with some peach notes, and it ends with some nice balance. Safale 04 FG 1.018 ABV 4.4% — This beer is clear, and it was clear when I bottled, when the Safale 05 was still cloudy. Again lots of fruity esters, more cherry notes, much stronger then the safale 05. Very mild spiciness from the hops. The mouth feel is much fuller, creamier, and much more malty. The bitterness is very much in the background here, and I don’t taste much by way of hops. This finishes a little maltier then the Safale 05. ECY #10 FG 1.018 ABV 4.4% — This beer is a bit cloudy. The aroma is spicy/phenolic (peppery), almost Belgian in character. I could not really smell much hops, the yeast seemed to dominate, and the spicy, slightly peppery taste carried through to the flavor or the beer, but the hop bitterness was much more noticeable. Again, I could not pick out much in regards to a flavor from the hops, but this finished more bitter then the other 2 beers. Critique: Ok, first, in regards to Sterling…not very impressed. It was very neutral, I had a hard time seeing what it contributed in aroma and flavor. The bittering was quite smooth, and I can see this being used in lighter ales or lagers for that purpose, but if you are looking for distinct hop character, this is not for you. Saaz has very distinct aroma, which I happen to love, and this just has hints of it in only one of the beers. I brewed this to be about the same bitterness of a bohemian pilsner, and with 38.5 IBU’s, it actually should be more bitter then my pilsner. However, I think this demonstrates the difference between IBU’s and flavor and aroma. This beer has 2.5 oz of hops, the pilsner has 4, and has a ton more character. I was worried if I hopped the same way as my pilsner, it would be way to bitter, but I gave up hop character in the process. The yeasts are a different story. First off, I don’t really love any of them. I was shocked by ECY #10 being so spicy. It is supposed to be more in the British line, but it tasted like a toned down version of a Belgian yeast. My first thought was “this would make a nice wit.” It also really seemed to make the bitterness pop more, but it is kind of too much. It is also the least clear of the 3, so this yeast does not seem to be as flocculant as the others. The Safale 05 was much fruitier then I was expecting. However, it was the most balanced of the 3, letting me get a hint of the hops taste and aroma without making them seem more harsh, and it was my favorite. The Safale 04 has a pretty characteristic “English” taste to it, but really subdues the bitterness and the hops. I thought this yeast may not attenuate as much, but it was the same FG as the ECY #10, and the malt to bitterness perception were night and day. If I had to do it again, I would have mashed cooler, and I also would have fermented cooler, closer to 65-66, so try to get a more moderate expression of the yeast. I have used all of the above yeast strains a great deal. In my experience, ECY 10 was very clean and far more flocculant than US-05 (though not so much as S-04). Granted, I fermented with that strain in the high 50’s and low 60’s (as I do with the Chico strain and Pacman). But I found it clean enough for my Black DIPA. Perhaps your fermentation temp was irregular or your yeast wasn’t very healthy? Interesting you had that experience. I did not have temperature control on these fermentations, because I only have one temperature control rig, and that may have played a role. Usually I find fruity/spicy notes when a beer is fermented too warm. These were brewed when the bigger problem is having them warm enough in my basement, but given the fruitness of the Safale 05 strain, they may have been too warm. That being said, I know 2 other homebrewers in my club try ECY #10 independently, and they had similar results. We all came to the same conclusion, and have dropped it from our lineup. Glad to hear you have had a better result. If those two other homebrewers also use no temperature control (or shoot for a 68-70F fermentation like many do), these results make a lot of sense.My experience shows a healthy pitch and a cooler fermentation produce a cleaner beer, which is probably why many craft brewers use English strains of yeast to produce excellent “clean” beers (Deschute’s Brewing uses WLP002/WY1968, for example). It stands to reason that ECY-10 is just a finicky strain that requires dutiful temperature control. That certainly makes sense. I know my experience with Safale 05 has been similar. It has a peachy note, and that is more pronounced when fermented above about 67F.